Nobody deserves compassionate gentle and attentive care more than our elderly. They cared for us, our families, our kids and sometimes even our pets, and they deserve the best in their time of need. My mother is nearly 93. She was a full time mother and homemaker and would proudly say “this is MY job”. There is no doubt that she excelled at her job. She cooked big nutritious meals well into her 80s, at that time for my Dad. He died in 2009, and her cooking pretty much stopped. She claimed she had ‘retired’. She gave birth to me and two brothers, taught us, nursed us, and nurtured us. She knit, crocheted, sewed, kept a spotless home, reupholstered furniture, painted walls and house trim, gardened, played, swam, fished, played cards, played piano, and attended church on every Sunday and Holy Day. She loved the water, swimming, boating, fishing and camping and a loud family party was always welcomed…food, drink, swimming or dancing. In their day, she and Dad could really cut a rug and I can picture them to this day dancing at my own wedding. She always had a wicked sense of humor and she was also a very strict mother…something that I didn’t always appreciate. But, in her eyes, I have become a “good girl”. I suppose that is so. Just to be very clear, she is considered royalty in her extended family. She is the youngest of 10 children, 7 rowdy brothers and 2 sweetheart sisters. She is the only sibling left and she has lived longer than any of them. Her Dad died when she was just 13, and her Mom lived on for many more years. Mums mother suffered with mental health issues, but she remained in her own home and the local sons checked in on her and brought her what she needed. Mum and her Mom relied on those older siblings for a lot of things. They took care of each other and they were a fun loving faithful and extremely entertaining and talented family. Mum married Dad in her early 20s and had my brother and me not long after. She also had one full term stillborn baby, and finally 18 years after me, my younger brother was born. She was 42 then. They survived poverty because of Dads hard work in a paper mill and some loans from family, and they built a comfortable life for themselves and us. They cleared a lot and built their own home from the ground up in 1955. Mum did most of the painting and decorating herself, including making lined draperies, curtains, and bedspreads, and reupholstering furniture. They lived at 18 Winter St in Millinocket, ME for over 60 years. So, when Mum started showing signs of dementia within a few years of Dad passing, it was alarming and so very difficult to process. She was the strong one. She saw Dad through his last weeks and months, dying because of Hospital Acquired MRSA and ongoing health issues. 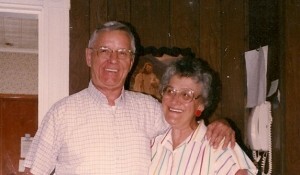 She went to him every single day for the three months while he was hospitalized and then in the nursing home. He only wanted her. Now she needed us, to help her and to guide her through her last years of life. She had no children living locally, like her Mom before her. And, she had no desire to move in with her kids. Mum very reluctantly left her home of over 60 years and has spent almost 4 years in Assisted Living here 5 miles from my home in Bangor, Maine. Even with her level of dementia, she has never forgotten her “home” and asked about it constantly. Sadly, I think she held me responsible for the loss of her own home. Of course, as her POA, I was responsible, but I did it with her safety and well being in mind. That house has been long since sold to a new family. My brother and I chose Winterbery Heights after looking at only 2 places. The other one was dirty, it stunk and the room was horrible…all for the same price. This one was certainly attractive and clean. It smelled nice. There were nice big windows and a lot of natural light. The staff was very welcoming and friendly offering a “Red Carpet” welcome. It was the Taj Mahal of local assisted living facilities. I have learned since that some of that glossy facade was deceiving and a lure, but there are certainly some exceptionally caring people employed by this place. I must give those workers credit. I have seen them work until they are red faced and sweaty caring for those elders. Staff faces changed all the time and only a very few of the staff from 4 years ago is still there. I stopped trying to learn and remember their names. I should have seen their staffing turnover as a warning. I assume that the ones who aren’t there anymore were either worked to death or they just moved on. The new director (the fourth one in 4 years) is also known for firing people at the drop of a hat, so I am sure that accounts for some of the more recent staff turnover. I learned two important things during Mums assisted living experience. Appearances are not everything, and you cannot expect excellent services just because a place looks nice. Also, Assisted Living is not a level of health care. 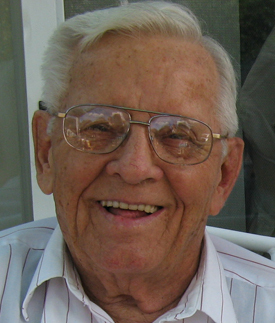 And one cannot expect and rely on caring, particularly if there is any decline in the resident’s strength or health. Basically, it is a hugely expensive rent with housekeeping, meals and a passing “look in” or reminder a few times a day, if that. That housekeeping is limited to vacuuming, bed changing, trash removal and bathroom cleaning. The kitchenette was filthy with dirty dishes, a sticky countertop and a mold clogged drain all the time, until I could get there to clean it. There was a layer of dust on everything. Furniture was not moved to clean underneath. If things fell onto the floor and it wasn’t in the middle of the floor, it did not get picked up. 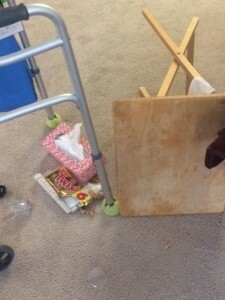 There was always a clutter of used tissues, candy wrappers and other debris around her lift chair and her bed. Until just recently I also had to do her laundry. After they started doing it because I nagged so much about it, many of her favorite clothing items and linens disappeared or were ruined. They do however poke pills into the residents regularly, because they make $500 extra a month for each resident. So, early on, to save Mum money I organized her medications myself for about 2 and a half years. They were poured into 28 day pill organizers, two of them, one for AM and one for PM meds. But, she started forgetting to take them, sometimes for several days at a time. I couldn’t rely on the staff to remind her and because I poured them, they could not legally take them out and hand them to her. If the resident is ill or having a bad day or week. they may be left in bed without food most of the day. If the resident “refuses” to change their clothes or go to bed, they will not “force” them, meaning they will not take the time to cajole or convince them that this is the safest and most comfortable thing to do. I have to say (in defense of the direct care staff) they do not take the time because they are understaffed and they do not have the time. Food may or may not be delivered when the resident cannot walk to the dining room. I can’t recall the number of times I have had to request an in room food tray for Mum on the days she isn’t up to the walk to the dining room. Unless the resident has a regular advocate or visitor, there probably will be neglect (unfed, unclean, not cared for) and that is what I found at my mother’s place this past week. I don’t blame the RAs (Resident Assistants). I blame the greedy for profit corporation that makes each of them “care” for 35 or 40 residents at a time for days and months at a time, with up to 15 of them needing to be lifted out of bed, the toilet, or chair. They are called lift assist residents. The Corporate owner of Winterberry Heights is Hawthorn Retirement. When a director assigns too many residents to the RA and then tells them, “I want you in and out of those rooms in 5 minutes” that is a direct order from the corporate voice that will result in neglect or harm to residents. It is a set up for neglect. It is a clear message that their job is to generate money for the Corporation. They accept residents (and their checks) who they cannot care for adequately with existing staff, to fill up the rooms and make a ton of money. They make promises they do not keep and they should not be allowed to even house residents with needs beyond what they can deliver. Mum’s “care” plan was one of the lowest priced ones at $4230 per month. All of her life savings was spent on assisted living. Assisted Living is not health CARE. Residents and families should be made aware of this right from the get go. Empty promises are just to get you in the door and to give them the first check for rent. There will be many exaggerated and then broken promises of “care”. My mother, and your elderly loved ones deserve better. 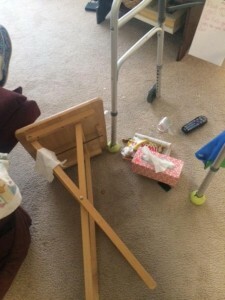 I will write about what happened to my Mom in a second part of this blog. This was just part 1.